We're fascinated by coffee's broad appeal from its caffeine allure to its healthy antioxidants, but most by its deep cultural edification and significance to the individual's routine. If you're like us, and we're betting you are because well, let's be honest you're reading a coffee blog, it's impossible to imagine starting the day without a brief moment of serene coffee routine. This is the first in a series exploring coffee rituals. To kick things off we spent a morning with our friend, Italian professor and pastry chef Joy Ramirez. 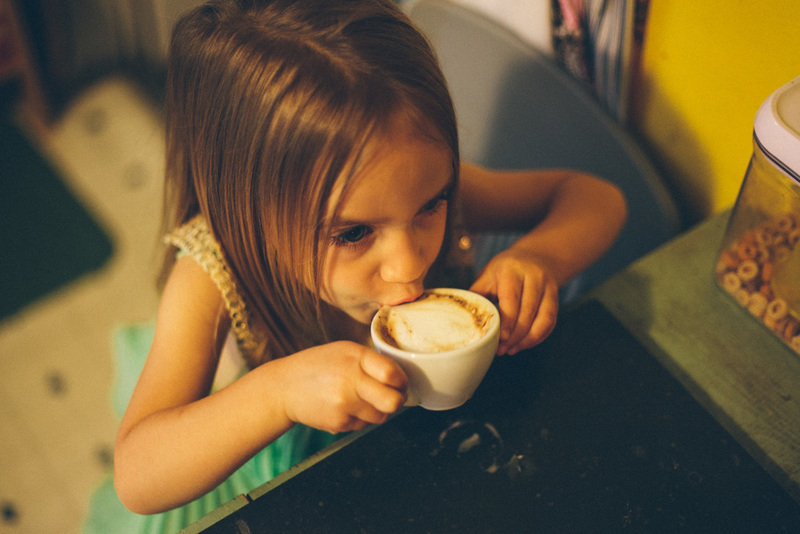 There is one thing that is indispensable for parents of young children and that is a healthy coffee habit. And it’s not just the need for caffeine, though that is not unimportant. For me, drinking coffee is about those few minutes each day when I get to relish in those familiar and repetitive motions of making it, the smell and the taste of it, the way it brightens my mood no matter how much sleep I’ve had or how much I will have to do that day. Since I started drinking coffee I’ve mostly enjoyed the ritual alone but now I share it with a special little person, my daughter June, age 4. I don’t give her actual coffee, although that day may not be far off. Most days she has what I call a “baby-ccino” – a little bit of hot cocoa topped with steamed milk served in one of my espresso cups. After all, she’s been listening to the sound of my espresso machine and its steam wand since she was in-utero. It’s a sound –and smell and taste-- that I believe is, by now, pretty comforting to her. My love for coffee was born when I lived in Italy for the first time more than 20 years ago. Like my relationship with that country, it has been with me ever since that first meeting and our bond has deepened, changed and evolved over the years. I now realize how lucky I was to be introduced to good coffee in the land that invented espresso and cappuccino. One of my first forays into speaking the language came in the café. I could order coffee before I could even exchange pleasantries in Italian. I learned quickly how to order the way the locals do: ‘un cappuccio e un cornetto’ (a cappuccino and a croissant, the small Italian variety found in every corner café or bar). Since I lived with a family in Florence that year, I also discovered how Italians make perfectly adequate espresso at home using the Moka, sometimes called Napoletana. No Italian home is without one of the uniquely shaped stove-top pots of various sizes. My Italian host would prepare the Moka each morning and leave it on the stove before she left for work so all I had to do was turn on the gas. She would also leave a pitcher of warm milk and a tin of biscotti on the table and that’s where my habit was formed—for better or worse—of eating something sweet with my coffee in the morning. When I returned to the States at the end of the year my suitcase was packed with a couple of Mokas and bags of Lavazza, the dark-roasted, finely ground espresso found in every grocery store in Italy. For the next 15 years the Moka was my only brewing method at home. I still loved going out to cafés and my college and graduate school years would have been impossible without the many good coffee shops I frequented in Boulder, Colorado. I’ve since moved on to other brewing methods at home, but every once in a while I’ll get out the Moka just for nostalgia’s sake and the sounds and smells of it percolating on the stove will bring me back to those first days of falling in love with Italy and with coffee. In 2006, a year after moving to Nashville, my dad gave me one of the best gifts anyone has ever given me: a FrancisFrancis X3 home espresso machine. I loved the sleek Italian look of the machines designed by Italian artists for Illy, one of Italy’s oldest and most iconic coffee companies. It wasn’t all looks either; it has a steel frame, a brass boiler and a professional steam wand for making perfect cappuccinos at home. I had clearly moved up in the world. This was fitting as I had moved to Nashville to take a job teaching Italian at Vanderbilt University. Looking back, these might be called the days of taking myself too seriously. When CREMA opened its doors not too far from where I live now with my family in East Nashville, I recognized kindred spirits who appreciate the importance of making coffee with intention and care. I’ve learned a lot over the years and I’ve even branched out into other ways of brewing at home and experimenting with lighter-roasted coffees and new (to me) brewing methods like the Chemex and French Press. I also realized, with time, that maybe Italians don’t know everything. A few years ago, the other important man in my life—my husband, who doesn’t drink coffee—gave me another great gift: a Baratza Virtuoso grinder. My Crema friends taught me how to use it, making a cheat sheet for me so that I could get the perfect grind for whatever brewing method I felt like using at home. In the summer I love to make iced coffee with my Chemex, preferring its lighter taste and bright flavors in the warm months. And when I have guests over I usually use my French Press. But most days, when I’m not sitting at the bar at Crema, I still use my FrancisFrancis, though now it’s with Crema’s lightly roasted espresso. I figure I’ve used that machine almost every single day for the last eight years so it’s gotten a lot of mileage. Recently, the portafilter started leaking water and I had to call the company to find out what to do. The rep told me that I could replace the rubber gasket and the O-ring for less than $10 including shipping. Or, I could look into buying one of their newer models that only use the capsule, or pod system, of making espresso. The model I have for using ground coffee is no longer manufactured. I took this as a personal challenge. Even though I was tempted to buy a new espresso machine and even flirted with a few different used models online (no pod system for me), I ordered those two parts and figured out how to replace them myself. Soon my old trusty machine was up and running again and extracting the perfect espresso. This was a satisfying experience. Sometimes the old is better than the new. Just like my coffee tastes, my relationship to Italy has changed over time. It has been several years now since I’ve made the trip. Life with a family makes it harder to go back every year like I used to. Even my Italian feels rusty now. The next time I go to Rome I will probably feel more like a tourist than ever before. But I know it won’t take long to get back to my Italian self, ordering my cappuccinos at the bar, this time with June and my husband in tow. I’m sure some things have changed even in the Eternal City I love so much. But one thing I know for sure: whether here or there, coffee will always be one of my favorite things in life.